Everyone’s excited about the summer season. While the season gets warmer, your online store should too. Take advantage of the people’s needs this summer. Trending products this season are generally summer essentials such as clothes, shoes, and travel bags. Get to know what people are looking for and what’s selling hot this summer. Please note that the products listed here are compiled from several sources across the web from high fashion brands to dropshipping suppliers. We also used Google trends to investigate how one product had been searched across the web worldwide within 90 days. Bikinis are still on top of the trend this summer. With 71k average web search per day in 90 days worldwide, bikinis are really hot this season. Related searches include bikinis for women, strapless bikini, h&m bikini, high waist bikini, and yellow bikini. According to Insider, high-waisted bikinis has become more popular on Pinterest than it has been in many years. It has earned its right to be among the products to sell this summer. Sunglasses seem to be always in trend regardless of the season. With an average of 66k web searches per day in the past 90 days, sunglasses have topped searches in the month of June. Related searches include Fendi sunglasses, Vogue sunglasses, and Versace sunglasses women. Popsugar has pulled out a list of great sunglasses to sell this 2018 from Embellished shapes to Flat-top Visors. Summer is time for tanning. Indeed, there are many folks around the world who want to achieve that golden tan. The search term tanning oil is rising in searches while tanning alone peaked at 100k a day in late June. 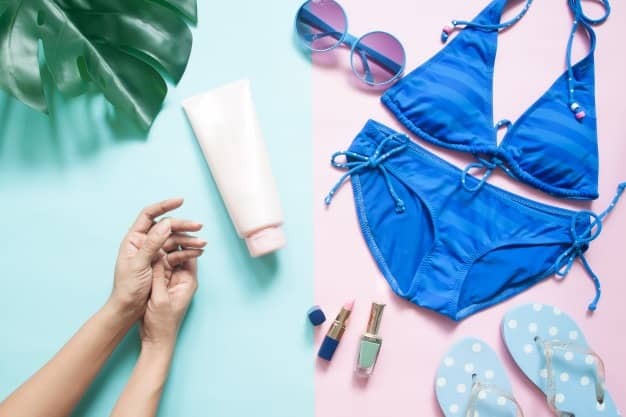 A report from ReportBuyer explains why tanning products are expected to see continuous growth in the cosmetics market. Sunscreen products are indeed essential in Summer. While everyone would like to have fun under the sun while diving into the water, there is still the importance of protecting the skin. In late June, sunscreen peaked at 92k web searches and continue to rise. Related searches include good vibes sunscreen, Australian gold botanical sunscreen, Rodan and fields sunscreen, and safest sunscreen for kids. This summer, we are all protecting ourselves from too much heat and summer umbrellas are among the must-buys this season. As it turns out, umbrellas are not just for the rainy days. This summer, people have proven to be yet inventive. There are big umbrellas for the beach, all unique and with varying designs and colors. RealSimple.com featured 6 cool umbrellas especially designed for the beach. Google trends show that in the first week of July, the search for umbrellas has peaked at 99k web searches worldwide. Meaning umbrellas are good products to add to your store this season. It’s not a surprise that flip-flops have a great comeback this summer. Telegraph reported that there are 399 pairs of Havaianas flip-flops being sold in every minute. This means that flip-flops in a variety of colors and styles are still trending. Google Trends also shows that flip-flops had been a favorite search this season, from May to the first week of July, this item had been consistently popular in searches this summer. Marie Claire featured summer trends in 2018 where it showcased the rise of the Statement Short that finishes just above the knee. High waist shorts made a come back with styles as featured by Louis Vuitton’s silky boxer style and Saint Laurent’s high-waisted leathers. The heat is on and the demand for summer dress is at its peak too. From bold stripes, shirt dresses, wrap dresses, and off shoulder dresses, they are all “in” this summer. And if there’s anything more popular for a summer dress, a breezy white dress is all the talk on Instagram. Complete your store listings with summer dresses. With ongoing beach season, it’s not an awful idea to include some added sun protection. While umbrellas are great, you’d rather have your hands free by using big floppy hats that are trendy and stylish. There’s a wide range of sun hats that you can include in your store to sell this summer. Check out GlamourUK for a wide selection of trending summer hats in 2018. Women are all set this summer. And they are going for beach bags all colorful and light. Trending beach bags brings good vibes and welcomes bright sunshine. Big brands in the industry like Vogue revamped the way beach bags look. They’re no longer just for the sandy beach but it can also be used around the city looking all stylish and glamorous. Travel bags are still “in” this summer with trips and vacations in mind. “Packing light” is what’s trending right now so bulky travel bags are out and in with stylish travel bags that have the perfect size to pack all summer essentials. PopSugar presents 24 perfect Travel Bags for a weekend of summer getaway. Add travel and luggage bags in your items to sell this summer and Maximize your profits this 2018.